How is technology being used in schools in India? Posted in English, Teachers and technology on February 3, 2017 by Nataasha Southwell. Technology is often seen as a solution to improving learning and teaching, but what exactly does this look like in Indian schools? Which types of technology are being used? Does technology actually enhance learning in this context, and if so – how? Can technology be successfully used in government and low-income private schools in rural India? To answer these questions, British Council India and Central Square Foundation recently launched a joint publication Teaching and technology: case studies from India edited by Dr Gary Motteram from the University of Manchester, UK. Twenty two case studies were selected from over 430 submissions following an open call. 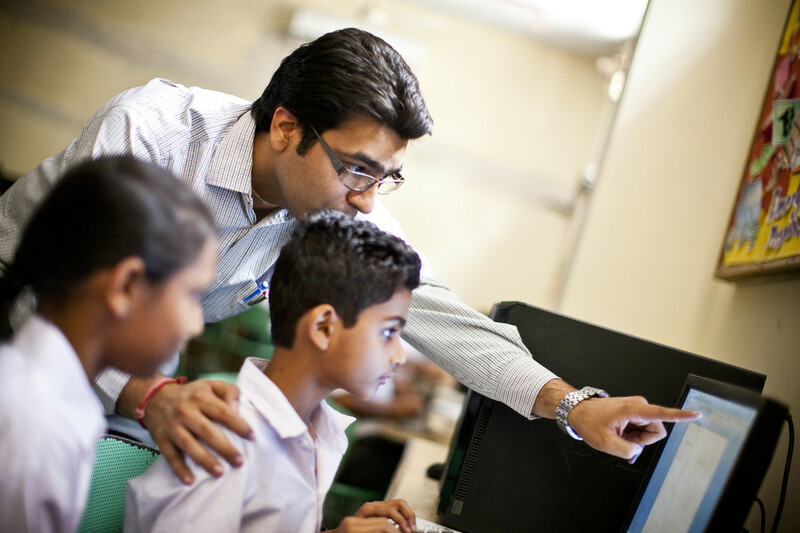 The selected stories highlight the innovative ways in which teachers, schools and organisations are using technology to improve student learning and teacher development across the length and breadth of India. The collected data highlights a number of interesting features. Technology is frequently used to show their learners videos or images are frequently used to demonstrate concepts more clearly. This is particularly prevalent in science classes, but also used in social sciences and English lessons. Many teachers give their students tasks and projects in which they have to research topics using the internet and then co-create presentations of their findings. Such tasks can also benefit learner autonomy, as learners are required to find things out for themselves rather than rely on the teacher and textbooks. This also helps to develop digital literacy and internet navigation skills. There are several examples of flipped classroom approaches, with teachers asking learners to watch videos or read articles before coming to class, so that class time can be used for going into more depth and clarifying any misunderstandings. A number of organisations aim to increase the quality of education available to disadvantaged learners by using tablets, videoconferencing, projectors and other technology to support their learning. Many teachers mention how they use technology for their own professional development, such as participating in social media communities of practice, following massive open online courses (MOOCs) and using the internet to deepen their own subject knowledge. This publication studies reveal that there are a lot of enthusiastic teachers and organisations using technology to enhance learning, and aims to inspire further action from others working in similar contexts. We strongly encourage you to try out some of the ideas from the case studies in your own schools, building on the knowledge and experience gained by these individuals. You can download or view the publication here, along with a research report published in 2016 on how teachers in South Asia use technology for their professional development. We will also be doing some further activity around the themes from the current publication and individual case studies in coming weeks, via webinars and our social media channels. Post by Rustom Mody, Senior Academic Manager – English Partnerships, North India.